Rinspeed is bringing a new EV concept, the Rinspeed UC?, to the Geneva Motor Show, and it might come to showrooms sooner than you think. Details and photos inside. Rinspeed will bring their Rinspeed UC? concept to the Geneva Motor Show next March. The joystick-operated car is meant to be named after a combination of the terms, "Urban Commuter" and "You see?" The Swiss company's engineers built the 2.5-meter long car with a motor that produces up to 124 Nm of torque. With batteries, the car is capable of a 120 km range, and can reach a top speed of 110 km/h. 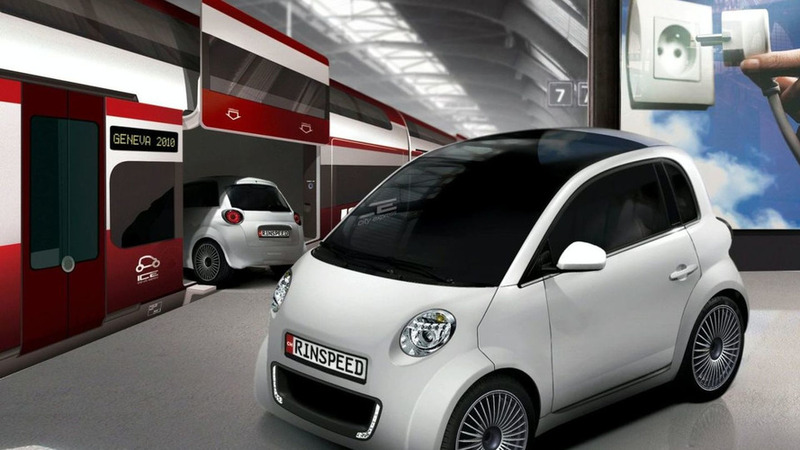 For extended distances, Rinspeed sees the possibility of the car being loaded on-and-off railcars. The idea would be that you drive the UC? to a train station in Geneva, get on the train with the car, then drive off the train 280 km in Zurich, or elsewhere. Although not mentioned in the press release, it appears from an official rendering that the car may be plugged in to any household electric socket. The company envisions a "mobile carport with integrated battery charging station" that may be reserved in advance online. Rinspeed is making serious strides to bring the car into production. The company believes the car could be outsourced to large scale manufacturers, and sold on the open market. More details about the Rinspeed UC? concept should be released leading up to the Geneva show in early March.